This is the 7th Operations Group patch. It shows the 4 squadrons that make up the group. On the bottom rocker it states "7th Operations Group". The 7th Operations Group is the operational flying component of the United States Air Force 7th Bomb Wing, stationed at Dyess Air Force Base, Texas. The group is responsible for executing global conventional bombing directed by proper command authority. It is the largest B-1B operations group comprised of 40 B-1s and 1,140 people assigned to four squadrons - 9th and 28th Bomb Squadrons, 7th Operations Support Squadron, and 436th Training Squadron. This patch does not come with velcro. The 34BS is part of the 28BW at Ellsworth AFB, SD. It operates Rockwell B-1 Lancer aircraft providing strategic bombing capability. The 34BS is presently the 4th-oldest active squadron in the Air Force, being formed on 10 May 1917, less than a month after the United States' entry into World War I. Members of the squadron participated in World War I, World War II, Korean War, Operation Enduring Freedom and Operation Iraqi Freedom. Today, the 343BS stands ready to provide combat-ready aircrews to project global power anytime in support of the Combatant Commander's objectives. I found this patch in a Korean embroidery shop, has the 'theater-made' feel to it with a 'cut-edge' border and twill background, and does not have velcro attached. 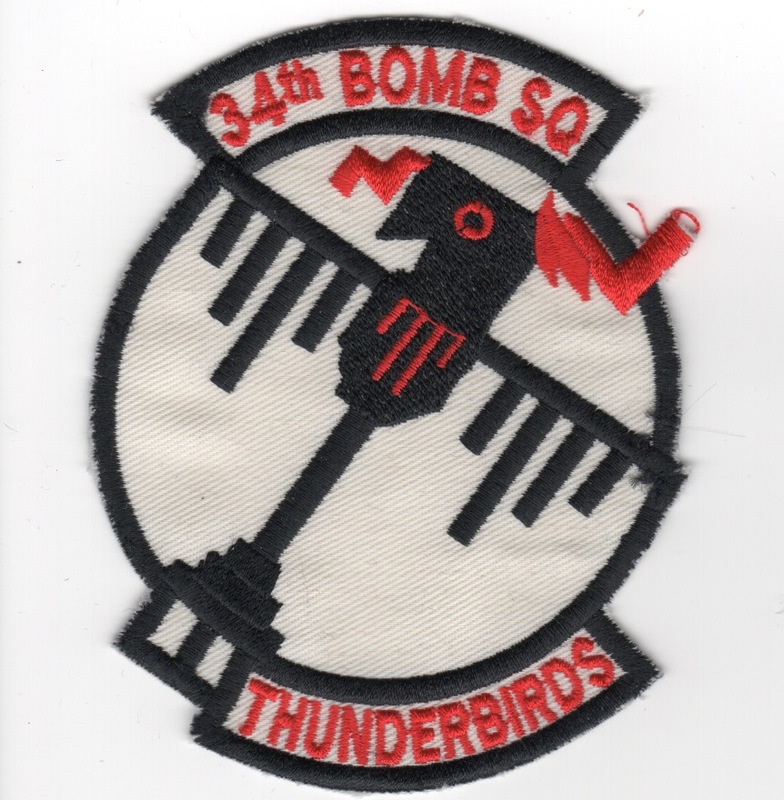 This is the desert version of the 34th Bomb Squadron's patch. They flew B-1s out of Mountain Home AFB, ID. This is a custom patch for the 34th BW. It says "We Piss Excellence" across the bottom. I'm not sure the significance of the patch as it was a custom job that the customer changed his mind on. This patch does not come with velcro attached. This is the color version of the combined expeditionary squadron patch for the 34th Bomb Squadron out of Mountain Home AFB, ID (see the bird design) and the 37th Bomb Squadron out of Ellsworth AFB, SD (see the stripes on the bird). Also, it has the combined 437 for the 34th and the 37th. This is the desert version of the combined expeditionary squadron patch for the 34th Bomb Squadron out of Mountain Home AFB, ID (see the bird design) and the 37th Bomb Squadron out of Ellsworth AFB, SD (see the stripes on the bird). Also, it has the combined 437 for the 34th and the 37th. 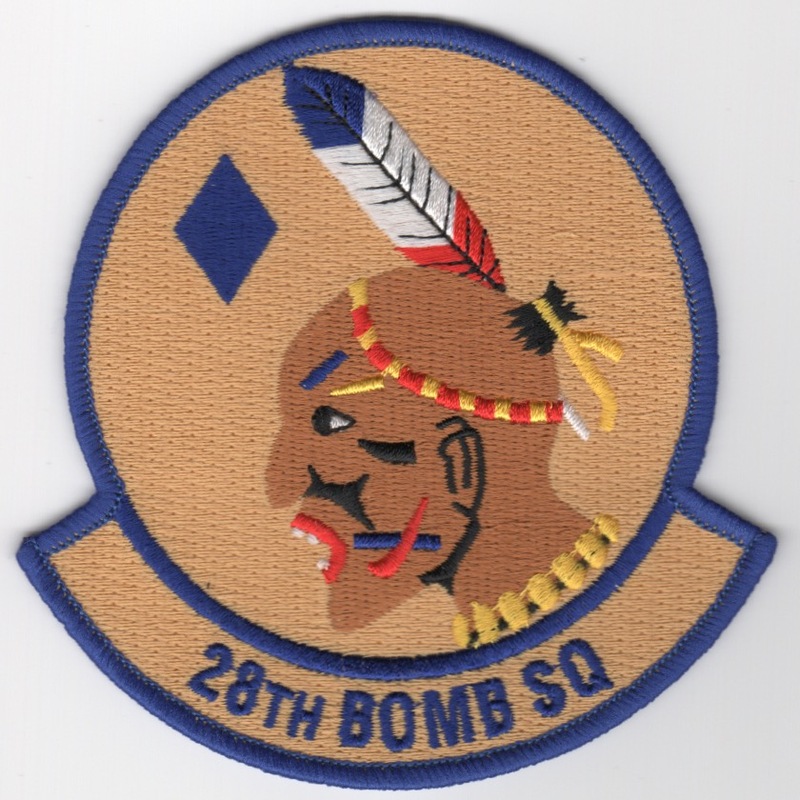 The 37th Bomb Squadron (37 BS) is part of the 28th Bomb Wing at Ellsworth Air Force Base, South Dakota. It operates B-1 Lancer aircraft providing strategic bombing capability. The squadron is one of the oldest in the United States Air Force, its origins dating to 13 June 1917, being organized at Kelly Field, Texas. The squadron deployed to England as part of the American Expeditionary Force during World War I. The squadron saw combat during World War II, and later became part of the Strategic Air Command (SAC) during the Cold War. 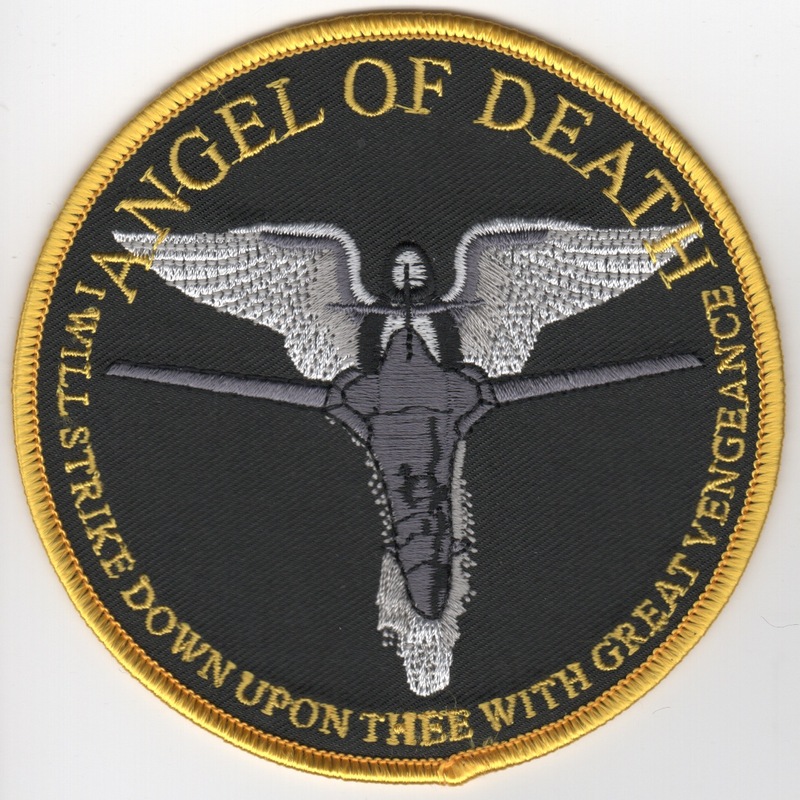 This is the "Angel of Death" deployment patch for the 37th Bomb Squadron out of Ellsworth AFB, SD. It says "I WILL STRIKE DOWN UPON THEE WITH GREAT VENGEANCE" along the bottom! This version of the patch does NOT come with velcro already attached. This is the "Angel of Death" deployment patch for the 37th Bomb Squadron out of Ellsworth AFB, SD. It says "I WILL STRIKE DOWN UPON THEE WITH GREAT VENGEANCE" along the bottom! This version of the patch DOES come with velcro already attached. 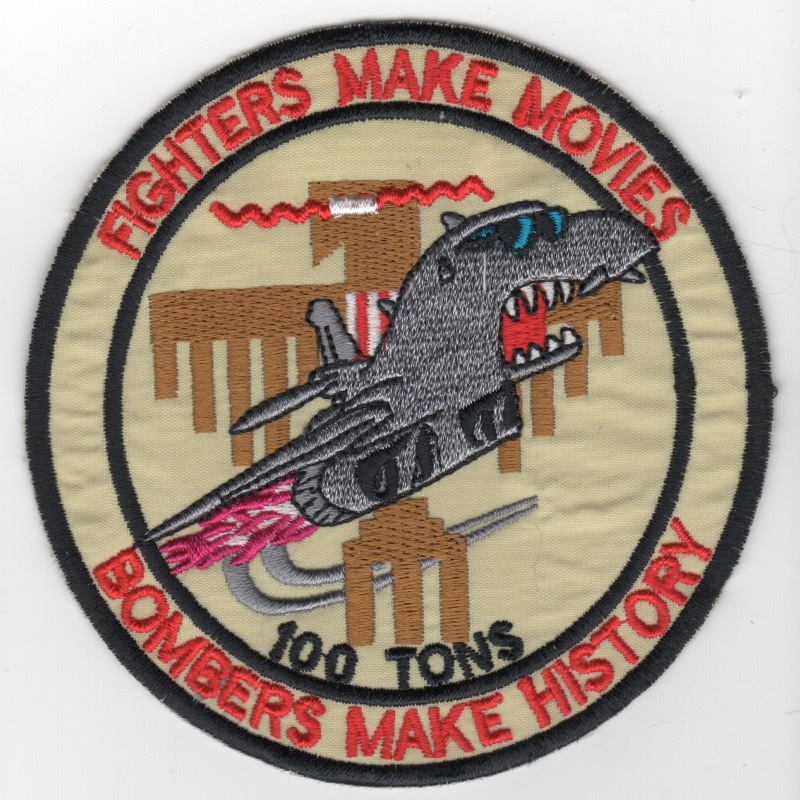 This is the "Tiger on the Bone (planform)" deployment patch for the 37th Bomb Squadron out of Ellsworth AFB, SD. This version of the patch does NOT come with velcro already attached. This is the "Tiger on the Bone (planform)" deployment patch for the 37th Bomb Squadron out of Ellsworth AFB, SD. This version of the patch DOES come with velcro already attached. 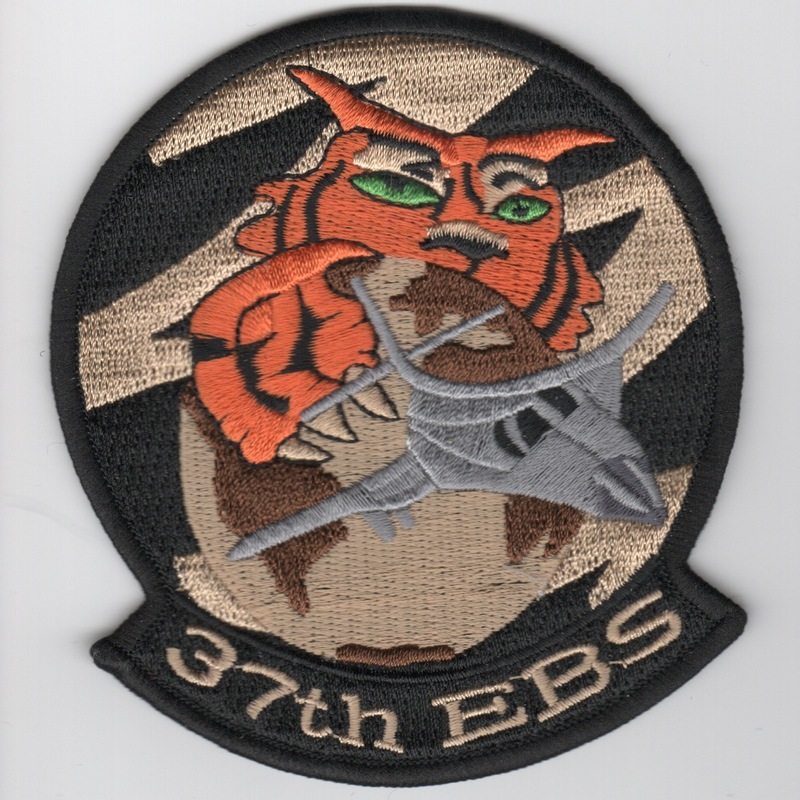 This is the "Tiger-face" deployment patch for the 37th Bomb Squadron out of Ellsworth AFB, SD. This version of the patch does NOT come with velcro already attached. This is the "Tiger-face" deployment patch for the 37th Bomb Squadron out of Ellsworth AFB, SD. This version of the patch DOES come with velcro already attached. 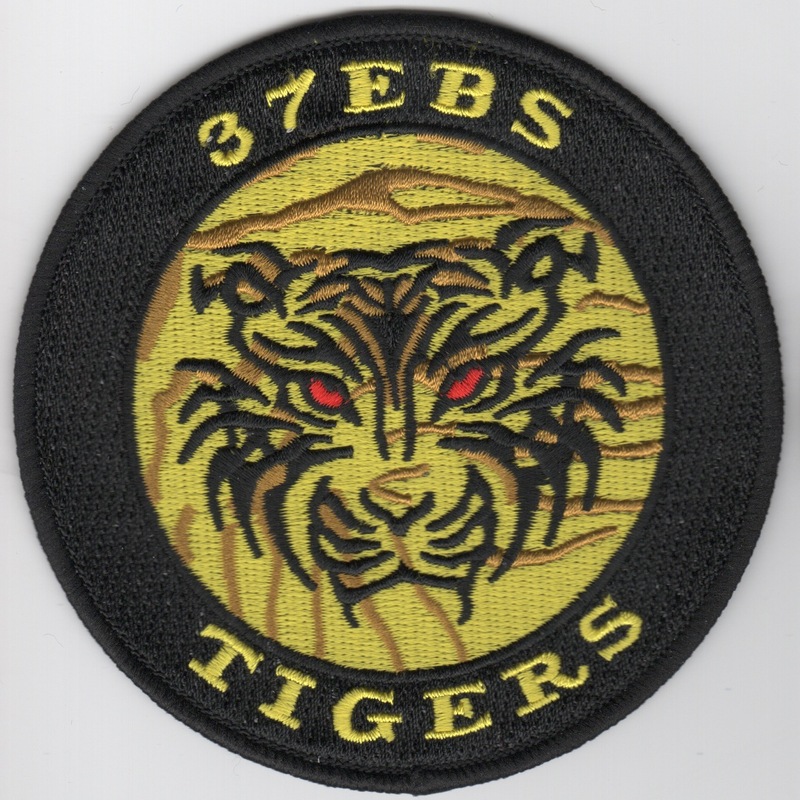 This is the "Tiger-side" deployment patch for the 37th Bomb Squadron out of Ellsworth AFB, SD. 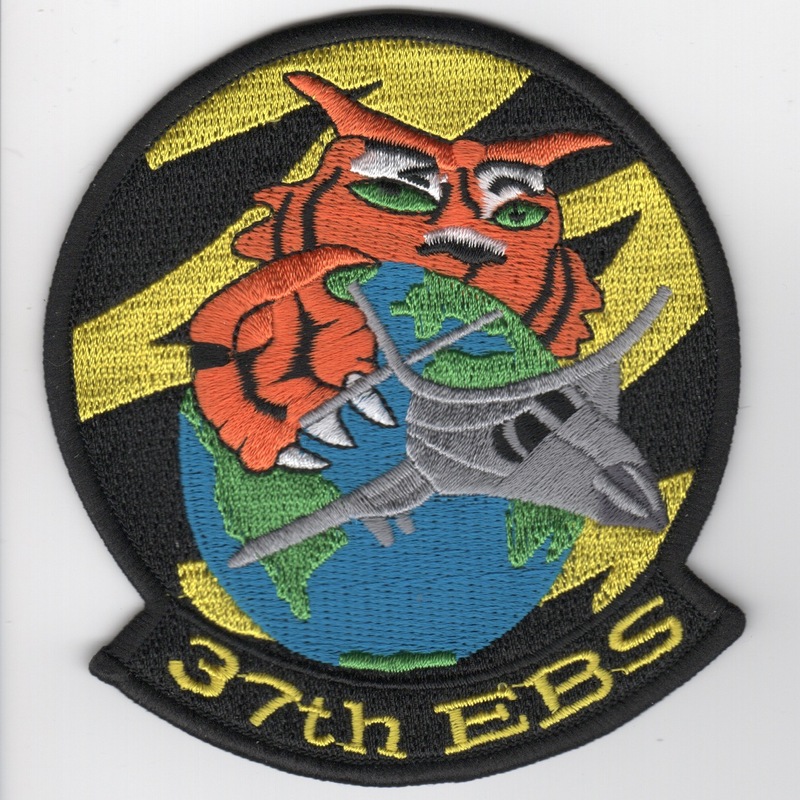 This version of the patch has the "37EBS" built into the tigers stripes (on the left) and does NOT come with velcro already attached. 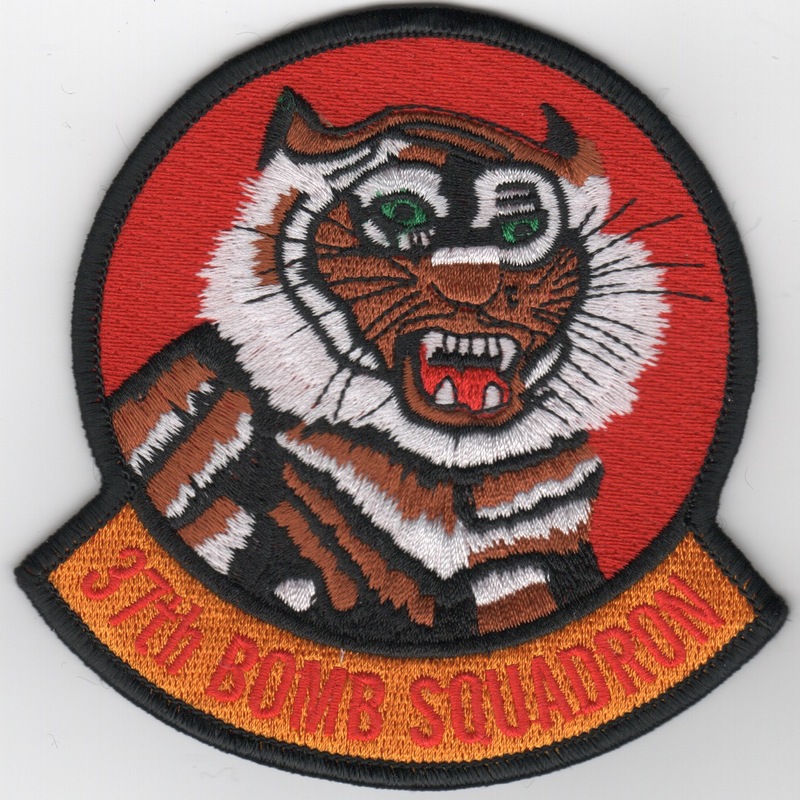 This is the "Tiger-side" deployment patch for the 37th Bomb Squadron out of Ellsworth AFB, SD. 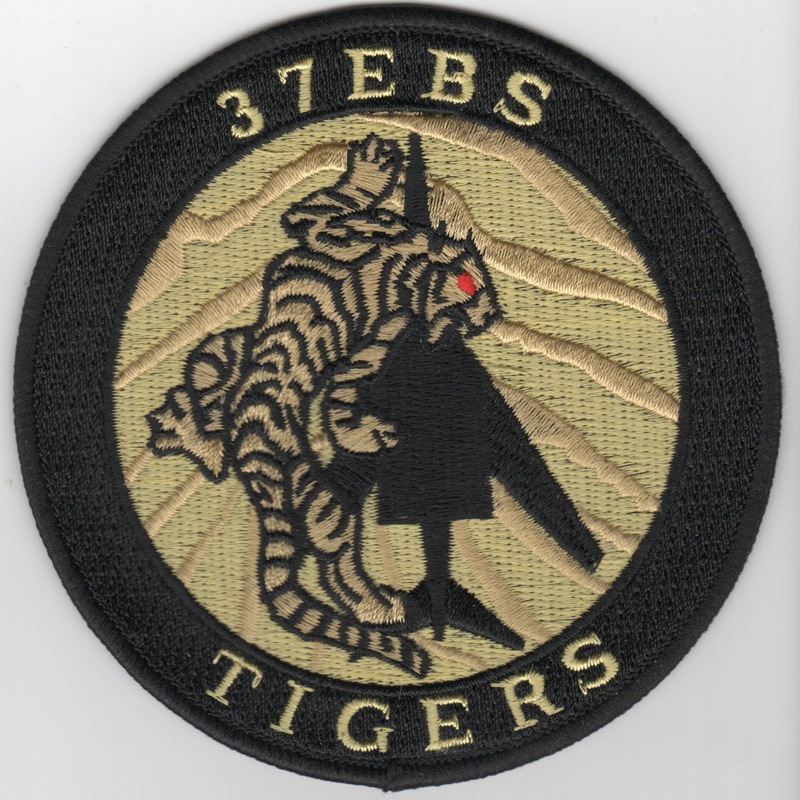 This version of the patch has the "37EBS" built into the tigers stripes (on the left) and DOES come with velcro already attached. 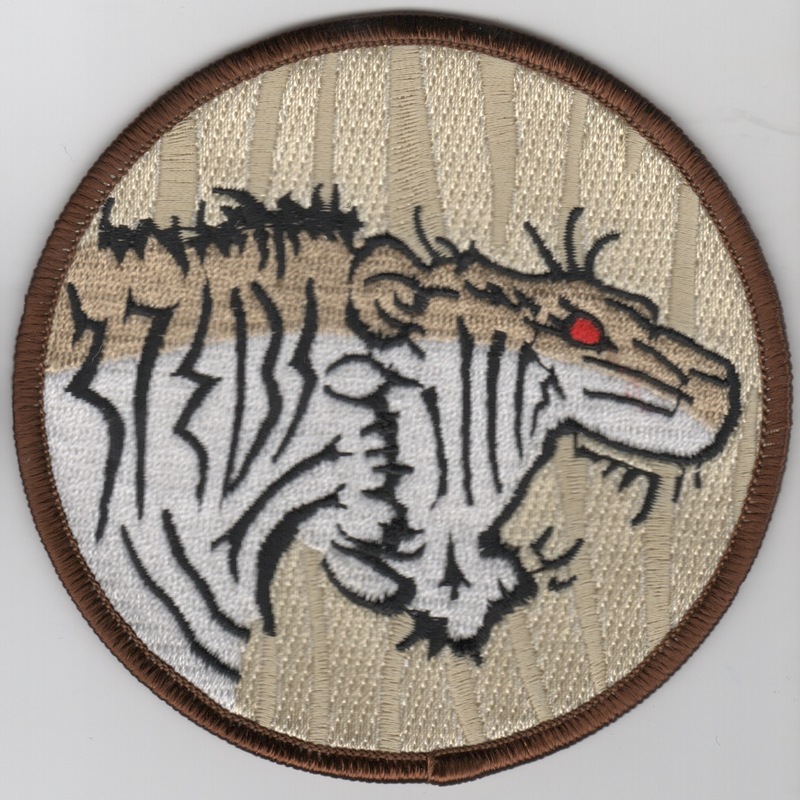 This is the "Tiger on the World" deployment patch for the 37th Bomb Squadron out of Ellsworth AFB, SD. This version of the patch does NOT come with velcro already attached. This is the "Tiger on the World" deployment patch for the 37th Bomb Squadron out of Ellsworth AFB, SD. This version of the patch DOES come with velcro already attached. This is the "Tiger on the World" deployment patch for the 37th Bomb Squadron out of Ellsworth AFB, SD. This is the desert version of the patch and does NOT come with velcro already attached. This is the "Tiger on the World" deployment patch for the 37th Bomb Squadron out of Ellsworth AFB, SD. This is the desert version of the patch and DOES come with velcro already attached. Homepage | Order B-1B Squadron Patches!